[A] sprawling city spread over 19 hills, or “jebels,” Amman is the modern – as well as the ancient capital of the Hashemite Kingdom of Jordan. It’s a vibrant city of many faces where the traditional society and modern sophistication go hand in hand. It is a fascinating city of contrasts – a unique blend of old and new, built between the desert and the fertile Jordan Valley. In the commercial centre of the city, you will find luxury hotels, top quality shops and restaurants, modern buildings and art galleries alongside traditional coffee shops and tiny artisans’ workshops. Throughout the city you will find evidence of a much older past, especially in the citadel, the old Souks and the Roman theatre right in the heart of the city. [L]ike many capital cities, Amman’s modern-day prosperity has resulted in a significant number of Jordan’s population choosing to live there. In fact almost half of Jordan’s population is concentrated in the tree-lined streets and avenues that comprise Amman’s residential suburbs. The downtown area is much older and more traditional with smaller businesses producing and selling everything from jewellery to everyday household items. 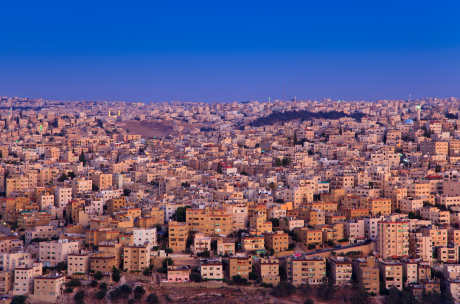 The people of Amman welcome visitors and they are extremely hospitable. They are multi-cultural, multi-denominational and well-educated and take great pride in showing visitors around their fascinating and vibrant city.